The past year has taken my art through a dramatic transformation. I found what art I was influenced by and what style truly suits me. Ever since my A Levels, 4 years ago, I have been interested in the aesthetics of street art. I used to paint photos of graffiti that I had seen first-hand – complicated and simple, all painted by my friends. I would mix different scenes with different graffiti in an almost perfectly neat style. From then on, I changed my style to a more rough-and-ready, Rauschenberg like style – dabbing leftover paint in random places, using and materials I found. My subject matter changed from portraits, to textured landscaped, to fashion magazines and collages, all the while keeping my painting style influenced by the crumbling bricks of those spray painted back alleys. My current art work consists of bleached film photographs that I collage images from magazines onto, with themes of popular culture. 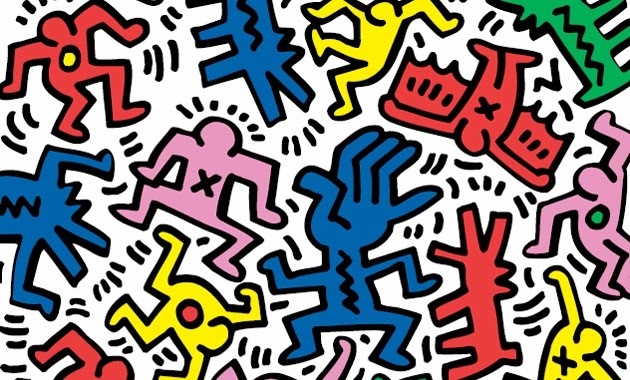 Before reading Haring’s book recently, I was quick to judge his cartoon like simple stick figures and unusual imagery, but now I understand his work, I am fascinated in Haring’s life, style and ideas, and plan to share his ideas in my future art work for my final year. My other main influences are Jacob Kolding, Robert Rauschenberg and Kurt Schwitters.